Rider and his Steed in the Desert, oil on canvas. 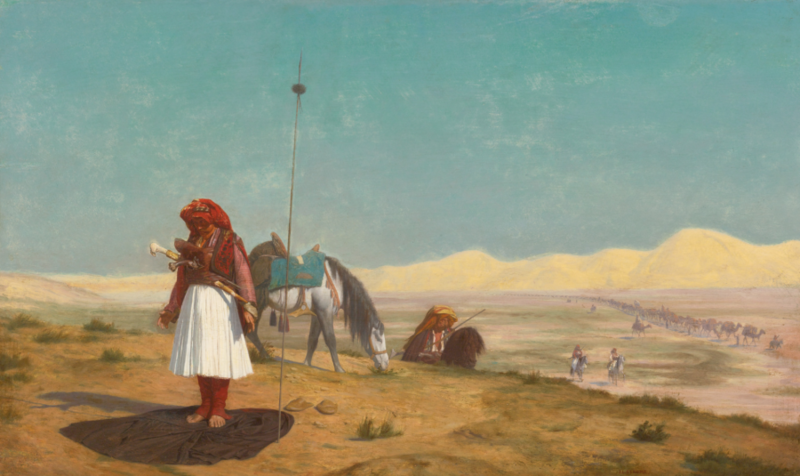 These rare works by French artist Jean-Léon Gérôme (1824–1904) are up for auction at Sotheby’s at the end of April for an anticipated sale in the region of US $1.3 to $1.98 million for Rider and his Steed in the Desert (above). 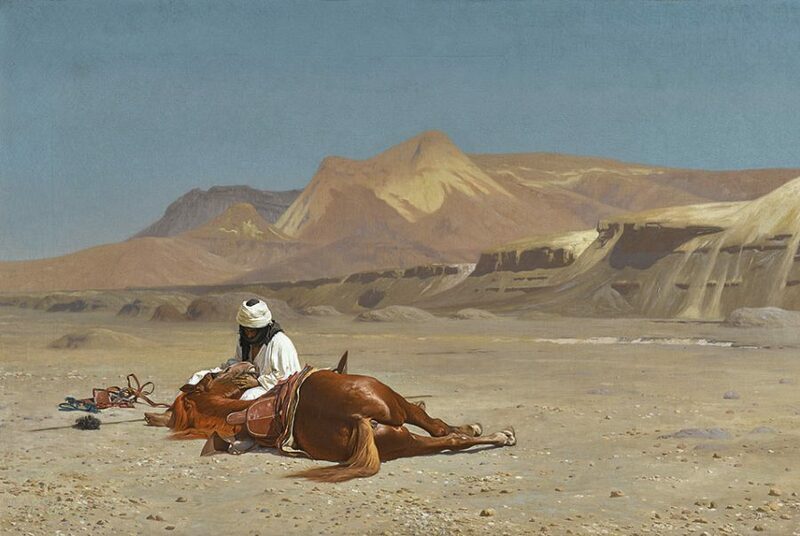 “Painted in 1872, this evocative work captures the moment on a hot afternoon in the implacable brightness of the desert sun, as a horseman comforts his exhausted steed against the backdrop of a range of barren hills,” Sotheby’s notes. With great mastery and a director’s eye for narrative, Gérôme evokes the utter stillness and loneliness of the desert air. The heat is made almost palpable to the viewer through the bright sun on the rider’s brilliant white headdress and dishdasha, and the sun reflecting off the horse’s shiny coat. Prayer in the Desert, oil on panel, 13 x 21½in. Evening Prayer Cairo oil on panel, 19½ by 31¾ in. 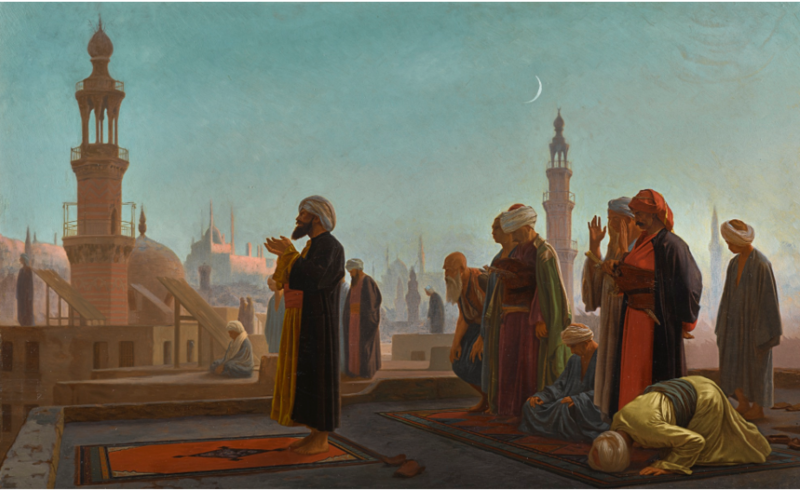 In the 1860s, Gérôme began a series of paintings depicting Muslim men at prayer. These would become a signature theme of the artist, and among his most popular Orientalist works. A Desert Encampment (1908) is by the famed artist Henri Rousseau, who studied in Paris in the studio of Jean-Léon Gérôme. While Gérôme was famous for his controlled academic style, Rousseau espoused the freer aesthetic – characterized by bold and dynamic brush strokes, Sotheby’s notes. 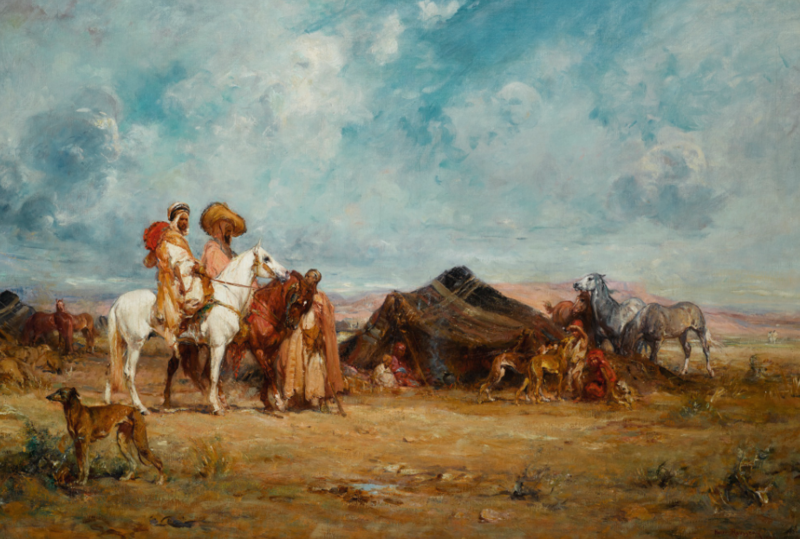 His paintings of Moroccan and Algerian life typically depict nomadic horsemen, surrounded by open spaces and high skies, or town scenes. Rousseau was born in Cairo and remained no stranger to North Africa. Sotheby’s Orientalist catalog for the April 29 auction, here. Yes to Lawrence of Arabia, I had similar thoughts. I didn’t know anything about this artist and his desert works captivated me. These are beautiful. The first painting looks like it came from “Lawrence of Arabia.” I’ve always been fascinated by the desert.